Want a trophy without all that effort or training? Well, you can technically pay to have your own trophies, which are replicas of the ones you earn from Mario Kart no less. Of course, they’re currently only available to European Club Nintendo members. 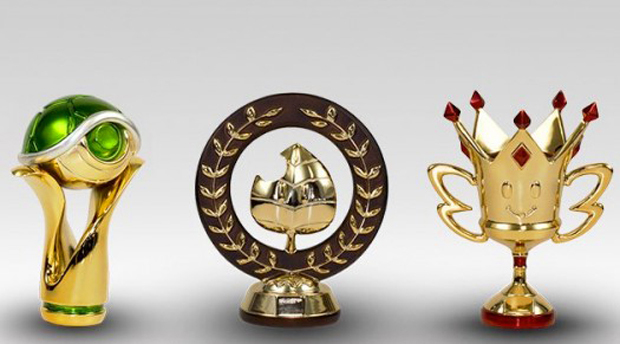 Before you go fraudulently changing your shipping address and information, just know that either 12cm x 10cm Shell, Leaf, or Special Cup trophies cost 5000 stars each. Logging back into my Club Nintendo after such a long time, know that registering your average Wii game is 50 stars and a DS game is 30 stars, plus 10 extra if you purchase it early and complete a survey. Even buying a whole Wii is about 1000 stars, so you’d need to buy 5 Wiis to get yourself just one trophy. They do look pretty sweet though, don’t they?